Tourists pose for photographs and read a restaurant menu in front of The Villa Casa Casuarina, a boutique hotel in Miami Beach, Fla.
Viewers intrigued by the Gianni Versace murder case featured in the new season of American Crime Story can retrace the fashion designer's steps at his former mansion in South Beach. Tourists stop on its stone front steps every day to pose for pictures where serial killer Andrew Cunanan fatally shot Versace in 1997. There's more to the Mediterranean-style mansion than Versace's death, however. Now a boutique hotel, The Villa Casa Casuarina, Versace's former home still reflects his glamorous designs and opulent lifestyle. Visitors can swim in the pool he lined with 24-karat gold tiles, sleep on double-king-sized beds so large they require custom-made sheets, gaze at the ocean from his rooftop observatory and dine in a gourmet restaurant established in his former dining room. 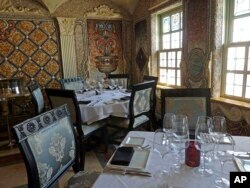 Mosaics that fashion designer Gianni Versace created for his dining room in his South Beach mansion are now the backdrop for the gourmet restaurant inside The Villa Casa Casuarina in Miami Beach, Fla., Dec. 26, 2017. The property featured in the new season of "American Crime Story" is open to restaurant patrons and hotel guests. "We actually have preserved what Versace created here and just augmented it with some modern touches for the convenience of our hotel guests and restaurant patrons,'' Copeland said. David Tamuty of Fort Lauderdale, Fla., lounges in the swimming pool at The Villa Casa Casuarina, a boutique hotel that once was the home of fashion designer Gianni Versace, in Miami Beach, Fla., Dec. 26, 2017. "It's just the history, and Versace was an artist, and I kind of consider myself a little bit of an artist. Maybe I can grasp a little bit of that, in a different fashion,'' Cargill said. To live like Versace is to live large, transforming the most ordinary things into outrageous memories. "I can't even hit all sides of the bed, it's so big. I just take a corner of it,'' Cargill said. The cast and crew spent about a month filming at the hotel, Copeland said. "It's really striking just how accurate they are,'' he said.